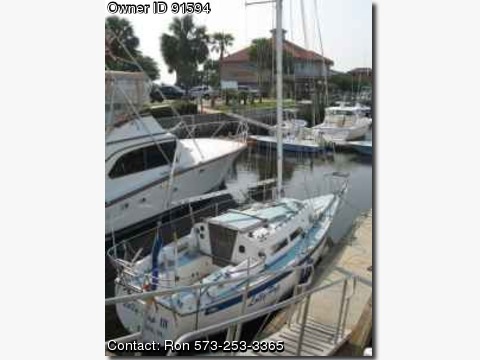 Winged Keel w/ extra ballast; Head w/ deck pump out; Galley and vanity sinks; Teak chart table; Screens; Ice box; Original two burner stove; Full set of marine cookware/flatware/china; Stern boarding ladder; Anchors w/ rodes/fenders/dock lines; Tiller w/ emergency spare; Bow stern jacklines/ lifelines; 2 1 speed sheet winches; Dodger dark blue; Spare fittings and fasteners filling a medium size tackle box, wrench and 3/8 socket set; Florida ICW east side charts state border with Georgia to Key West, 2006 binder of ICW to Delaware; Radio with mike and antennae and a few flags; RECENT: UK full-battened Dacron main, 150 Dacron Genoa, 110 Dacron working Jib, 45 Dacron storm Jib, Bierig Cruising spinnaker, Balloon spinnaker, Maind Sail cover and sail bags for others: Recently upgraded standing rigging; Spinnaker gear; Spinnaker pole; Wisker pole; 2 2 speed sheet winches, New Electric and manual bilge pumps and hoses, new spare electric bilge pump; New Engine Water pump impeller, shaft and seals with spare new impeller and cover gasket; Shore power; GFI and DC outlets; 2 deep cycle batteries. All cushions in excellant shape. Other extras, Boat is sleek and gets many compliments, fully rigged out to sail.